Lead author Dr. Rob Massom, of the Australian Antarctic Division and the Antarctic Climate and Ecosystems Cooperative Research Centre, said that reduced sea ice coverage since the late 1980s led to increased exposure of ice shelves on the Antarctic Peninsula to ocean swells, causing them to flex and break. "Sea ice acts as a protective buffer to ice shelves, by dampening destructive ocean swells before they reach the ice shelf edge," Dr. Massom said. "But where there is loss of sea ice, storm-generated ocean swells can easily reach the exposed ice shelf, causing the first few kilometres of its outer margin to flex." "Over time, this flexing enlarges pre-existing fractures until long thin 'sliver' icebergs break away or 'calve' from the shelf front." "This is like the 'straw that broke the camel's back', triggering the runaway collapse of large areas of ice shelves weakened by pre-existing fracturing and decades of surface flooding." Study co-author Dr. Luke Bennetts, from the University of Adelaide's School of Mathematical Sciences, said the finding highlights the need for sea ice and ocean waves to be included in ice sheet modelling. This will allow scientists to more accurately forecast the fate of the remaining ice shelves and better predict the contribution of Antarctica's ice sheet to sea level rise, as climate changes. "The contribution of the Antarctic Ice Sheet is currently the greatest source of uncertainty in projections of global mean sea level rise," Dr. Bennetts said. "Ice shelves fringe about three quarters of the Antarctic coast and they play a crucially important role in moderating sea level rise by buttressing and slowing the movement of glacial ice from the interior of the continent to the ocean." "While ice shelf disintegration doesn't directly raise sea level because they are already floating, the resulting acceleration of the tributary glaciers behind the ice shelf, into the Southern Ocean, does." Study co-author, Dr. Phil Reid, from the Australian Bureau of Meteorology, said the research identifies a previously under-appreciated link between sea ice loss and ice shelf stability. "Our study underlines the importance of understanding the mechanisms driving these sea ice trends, particularly in regions where sea ice acts as a protective buffer against ocean processes," he said. In only a matter of days, the collapse of the Larsen B Ice Shelf in 2002 removed an area of ice shelf that had been in place for the previous 11,500 years. 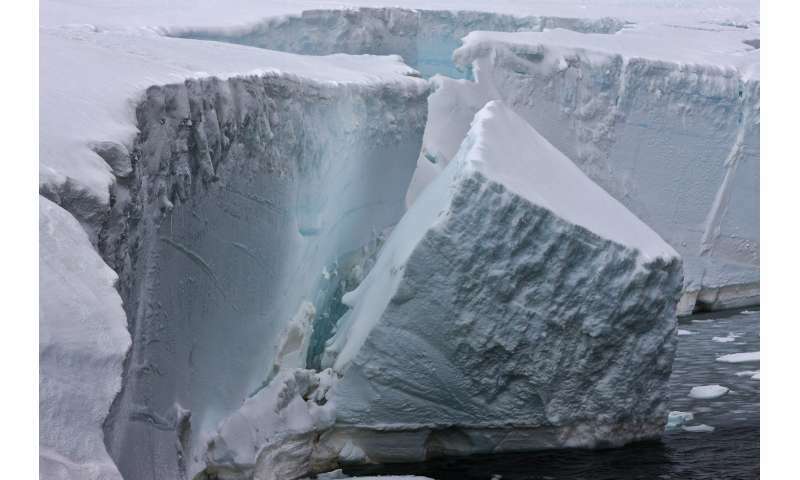 Removal of the ice shelf buttressing effect also caused a 3- to 8-fold increase in the discharge of glacial ice, behind the shelf, into the ocean, in the year following disintegration.